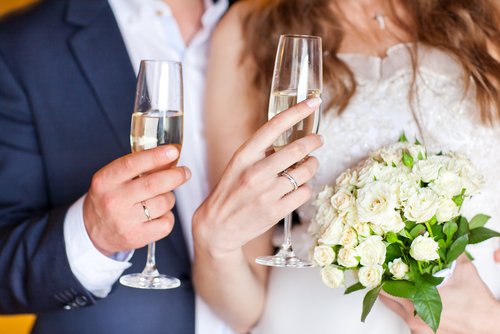 6 Tips For The Perfect Wedding Toast! Your wedding ceremony was lovely – you declared your love for each other in front of all your favorite people and now it’s time for the toast. From thanking family and friends for all their support over the years to advice on long-lasting love, the toast can truly be an inspiration and something to remember. Whether the toast giver is a parent, someone from the bridal party or even the bride or groom, planning a wedding toast can be a bit of a challenge. Check out these tips on how to plan a wedding toast and leave the guests with something special to remember. Use quotes about love, commitment and passion to help inspire. Dig up old family photos or photos of the couple through the years. Think back on love and loss in your own life and how special it is. If a joke fits your personality, then go ahead and start with one. Share a story about your relationship with the couple. Keep it tasteful, elegant and something even the grandparents will love. Are you in the process of planning a wedding toast? What’s working in your process?